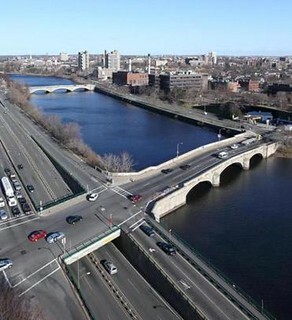 PAT GREENHOUSE/GLOBE STAFF/FILE 2010 The Charles River Conservancy has urged the state to build underpasses for the River Street and Western Avenue bridges (both shown) and the Anderson Memorial Bridge. THANK YOU for Sunday’s editorial highlighting the efforts of the Charles River Conservancy to build pedestrian underpasses at the River Street, Western Avenue, and Anderson Memorial bridges along the Charles River (“Faster and safer along the Charles River,” May 18). As a car owner who drives daily and a runner who runs daily, I welcome the safer, less congested intersections the underpasses would provide. From the perspective of a car owner, I know the stress of driving. The underpasses would not only allow traffic to efficiently flow through these major intersections but would also eliminate the risk of colliding with, for example, a small child who inadvertently rides her bike into the intersection. From the perspective of a runner, the intersections must be more pedestrian-friendly. I have been nearly hit while legally crossing at these three intersections, and I frequently hear stories from runners, cyclists, and families of their close calls with cars. The state Department of Transportation should reconsider adding a pedestrian underpass to the Anderson Bridge now, while it is under construction. With the discussion around fitness and public health, these underpasses are a win-win opportunity for the state and the city to improve our infrastructure for the safety and enjoyment of drivers, runners, cyclists, and families. The writer is chairman of the Cambridge Running Club.